This rhubarb crumble recipe has been waiting around a bit to be blogged about and there is no reason for it other than that I have been busy. I made it for the dinner party a few weeks ago. 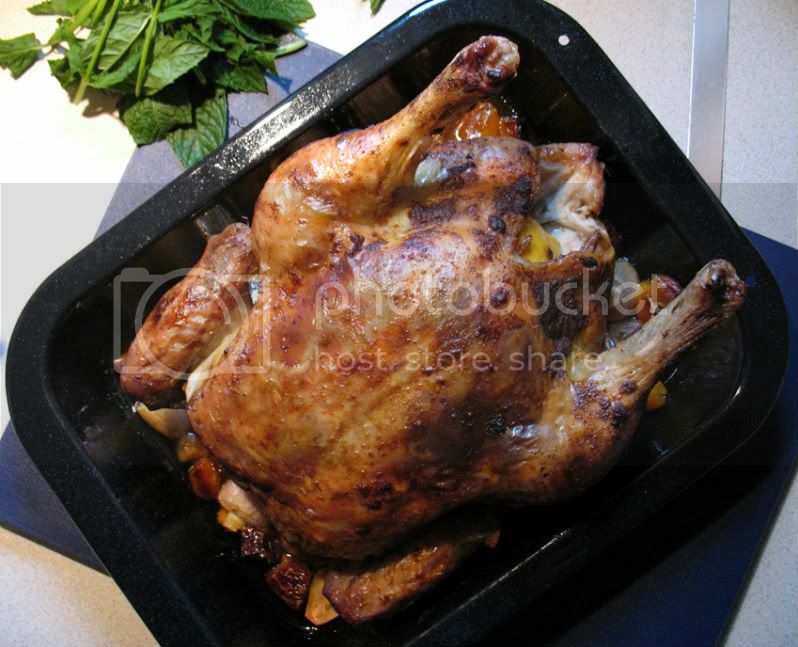 When I was going through my cookbooks to see what kind of roast chicken to do, I came across the recipe (well, the picture first) and knew that I just had to give it a go. It's from Gordon Ramsey's Sunday Lunch cookbook, and whether you like the man or not, he can cook. 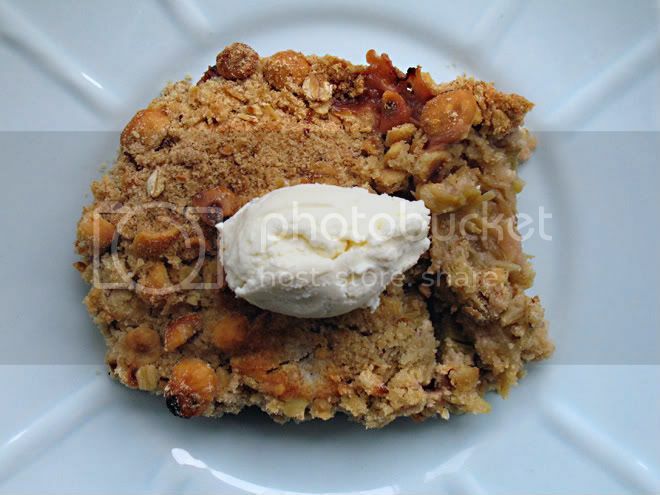 I liked the sound of the ginger and nuts in this crumble, so the chicken was forgotten, at least for a little while, while I started jotting down the rhubarb crumble ingredients on my shopping list. I changed the recipe a little bit as even after my shopping trip I didn't have any stem ginger or vanilla sugar, so here is my version with the original in brackets. Toss the rhubarb in the sugar and place in a large pan over medium heat. Add two tablespoons of water and the vanilla essence and cook for bout 8 minutes stirring once or twice carefully. You don't want it to go to soft, the pieces should feel just tender when pierced with the tip of a sharp knife. Add the ginger syrup, carefully stir and pour into a 1.5-2. litre baking dish and set aside to cool. 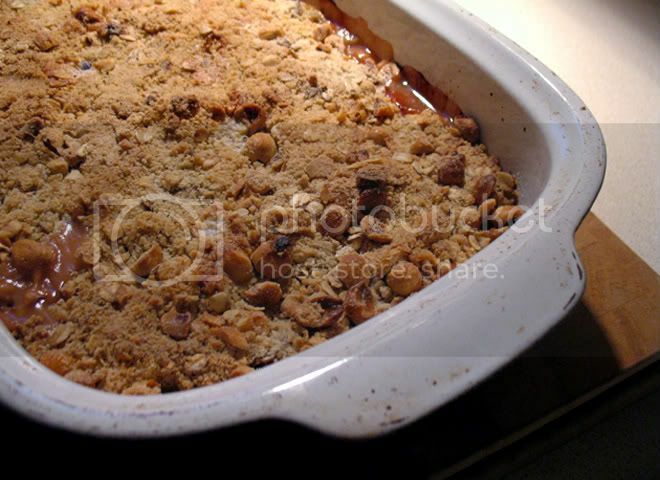 While it's cooling you can start making the crumble. In a large bowl slightly crush the hazelnuts with a rolling pin, alternatively place them in a freezer bag and bash them a little with a pan or a rolling pin. 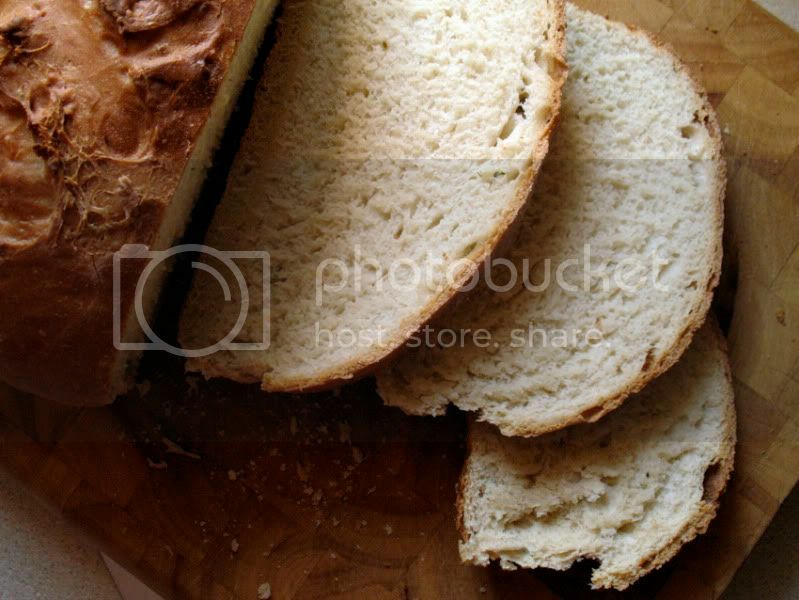 In another bowl rub the flour and the butter together with your finger tips until they form a crumb-like mix. Add the demerara sugar, nutmeg, oats and nuts and mix well. Evenly spread the crumble over the cooled rhubarb and bake for 20-25 minutes until golden brown. While it's cooling, mix the mascarpone with the lemon zest and ginger syrup to serve with your crumble. Of course it also goes well with ice cream or custard. 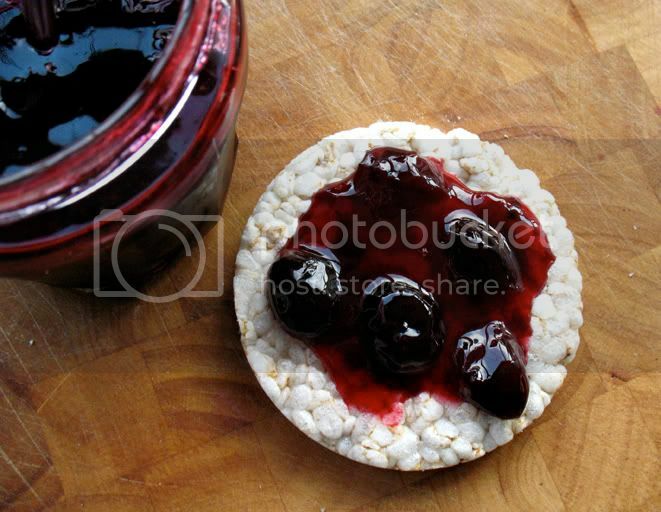 On Sunday my friend J told me that one of the small local green grocers had boxes of cherries on offer for just £2.99 and that she'd been making cherry and blueberry jam just that afternoon. Hearing this I just couldn't resist to get on my bike on Monday and nip down to bag a bargain for myself. Cycling home with a wooden box containing 4 lbs of black cherries strapped to my pannier rack, my mind started to race through various possibilities of using them even before I got home. 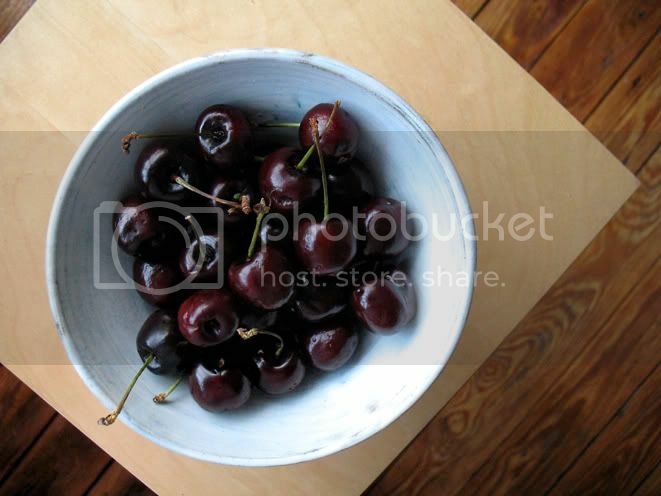 To eat them fresh as they were, make cherry pie, clafouties, pancakes or to make jam, that was the question. Initially the thought of removing the stones of 4lb of cherries all at once to make jam put me off that possibility, but after a little nap I thought 'what the heck' and got to work. I remembered that I bought a Jam and Preserves cookbook last summer which I had never used and in it I found a recipe for Black Cherry and Brandy Jam. I didn't have any brandy in and having already been on my bike to buy the cherries and then again later to by jam sugar I didn't want to go out again, so I decided to make Black Cherry and Cointreau Jam instead, following the recipe and just switching the types of booze. My fingers looked like I had murdered somebody (next time I'll remember to put on gloves), my white kitchen wall now sports some blue speckles and I nearly burned my fingers sterilizing the jars, but it was well worth it. Not just because the jam is really good, but also because I've already been able to make some friends happy by passing on a jar of the finished jam. 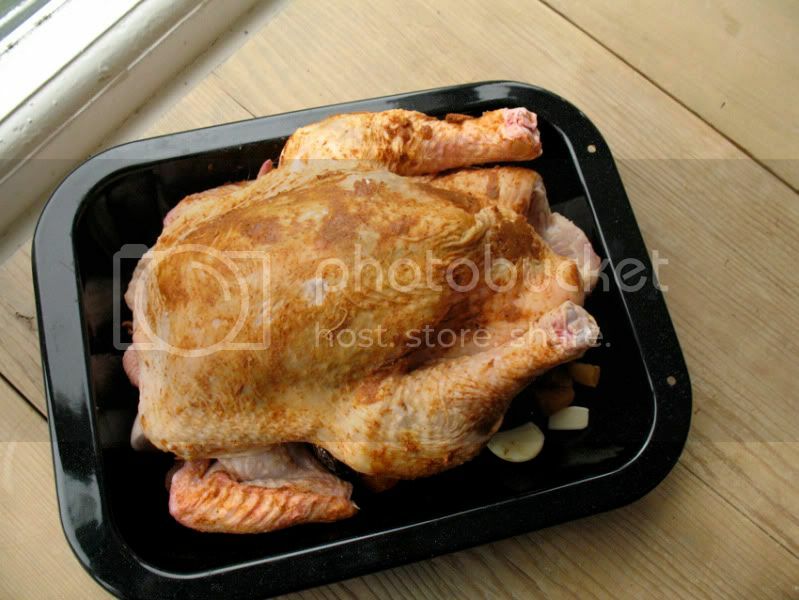 Roughly chop the and place them in a large sauce pan or preserving pan. Add the lemon juice and simmer over a gentle heat for about 20 minutes, until the cherries are quite soft. Add the jam sugar and stir until disolved. Increase the heat and boil rapidly for four minutes. Take off the heat and carefully pour into warm sterilised jars. Heating the jars and placing them on a damp towel will stop them from cracking when you fill them with the hot jam. Screw on the lids and place upside down until cool. 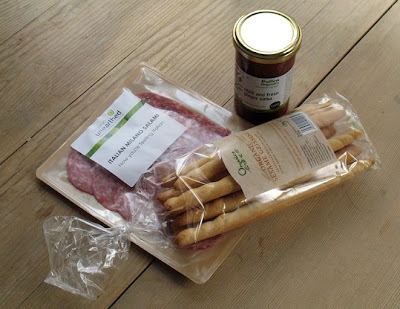 Before I catch up on some of the recipes I tried over the last couple of weeks I thought I'd write about the parcel I got from Abel & Cole with some samples from their summer range of deli foods. It contained sliced Milano Salami, Sesame Artisan Grisini and a jar of Chili and Fresh Ginger Salsa, all organic and great quality. So, I went out and got some cheeses, my friends E and JM added some olives, sun-dried tomatoes- stuffed peppers, saucisson and fresh bread and we had a wonderful supper that made us feel like we were on holiday somewhere in Southern Europe, even though we were sat in a Manchester living room. Out of the samples I was sent my favourite was the Pollen Chili and Fresh Ginger Salsa. I have to say I love pickles and salsas and to me they are a vital addition to any cheese board. The Chili and Fresh Ginger Salsa, was not too hot and not too tangy, a great balance between sweet, spicy and sauvoury. It went especially well with the goats cheese we had I thought. My friend A has invited me and five other friends (plus kids) for dinner tonight. I offered to help out and make one of the dishes as it is quite a big job to cook for so many and of course because I like to cook anyways. A's menu for tonight is vegetarian, which he's a bit worried about as he really likes his meat and rarely cooks veggie, but not all the other guests do share in his carnivourous preferences. So as to not to have to add any more worry, he decided to make a curry as he's good at it and South Asian is one of his favourite cuisines. 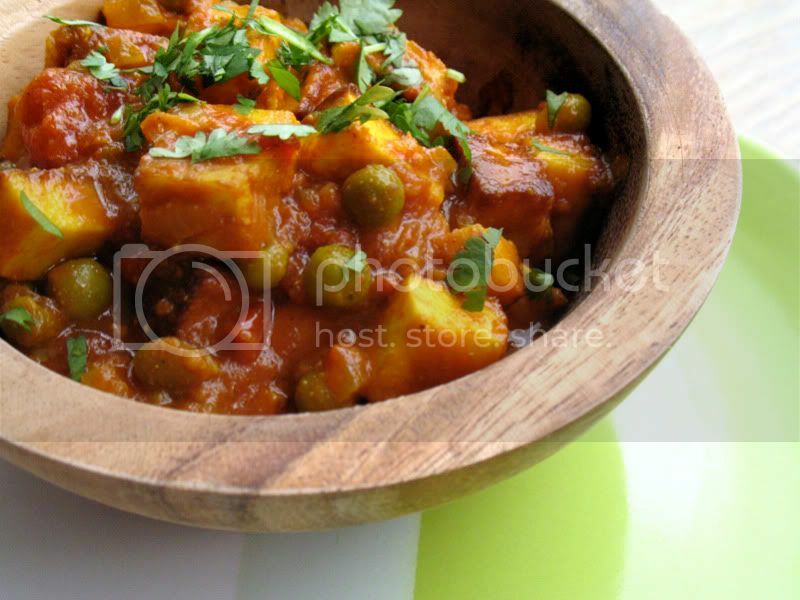 He is cooking a cauliflower and potato curry and I thought Muttar Paneer would go quite well alongside it. 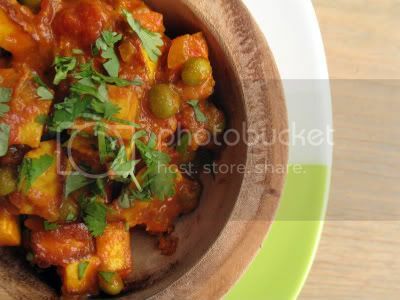 If you haven't heard of Paneer or Panir before, it is a South Asian cheese, which doesn't melt when cooked and therefore makes a perfect ingredient for a vegetarian curry. 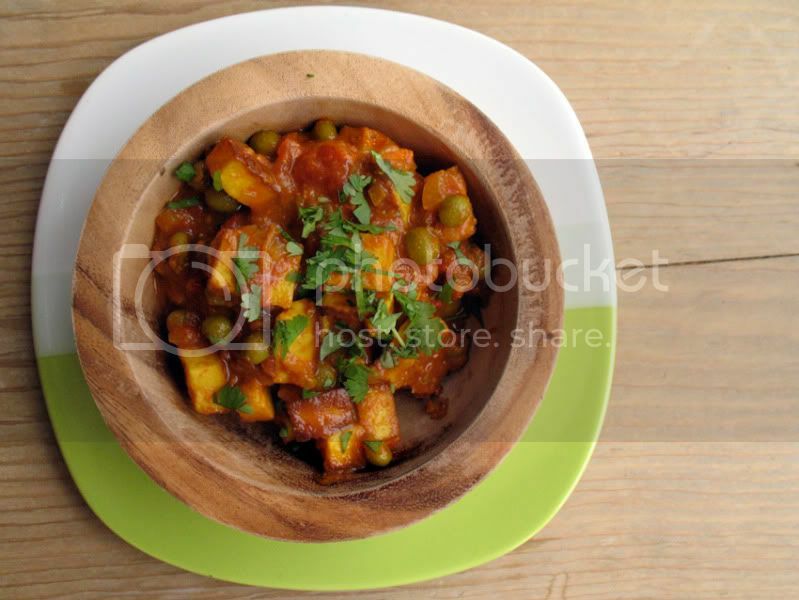 Muttar Paneer originates from the Punjab and is not a particularly spicy curry, instead it has many subtle flavours that compliment each other perfectly and are well balanced. If you prefer a bit of heat though, just add a finely chopped chili. Heat the oil or ghee in a large heavy bottomed frying pan. Add the cuben paneer and fry until golden. Remove from the pan and set aside. If necessary add a little more oil or ghee and fry the onions, until soft and golden. Now add the spices and the garlic and fry for another couple of minutes until fragrant. Add the tomatoes and about 250ml (1cup) water and stir. Bring to a a boil, reduce the heat and simmer for about five minutes. Add the peas and return the fried cheese to the pan. Cover and continue to simmer for about 20 minutes. 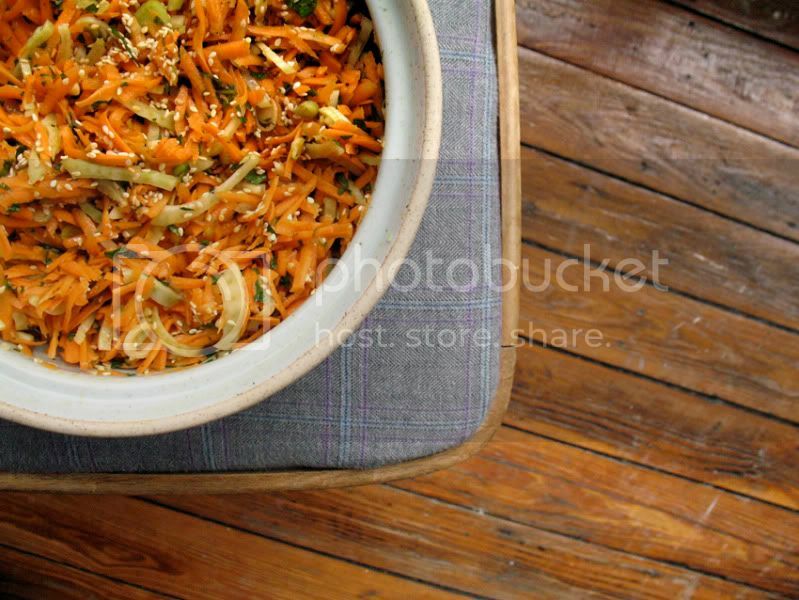 Serve with pilau rice and/or naan bread or chappati. As some of you might know I am an artist/practitioner/photographer. Which of these, I am never quite sure of. I guess it depends on how you define the terms. I also teach photography, and I find that often I don't seem to make enough time for my own practice, unless I work on a big project. I decided it was time for some daily discipline. 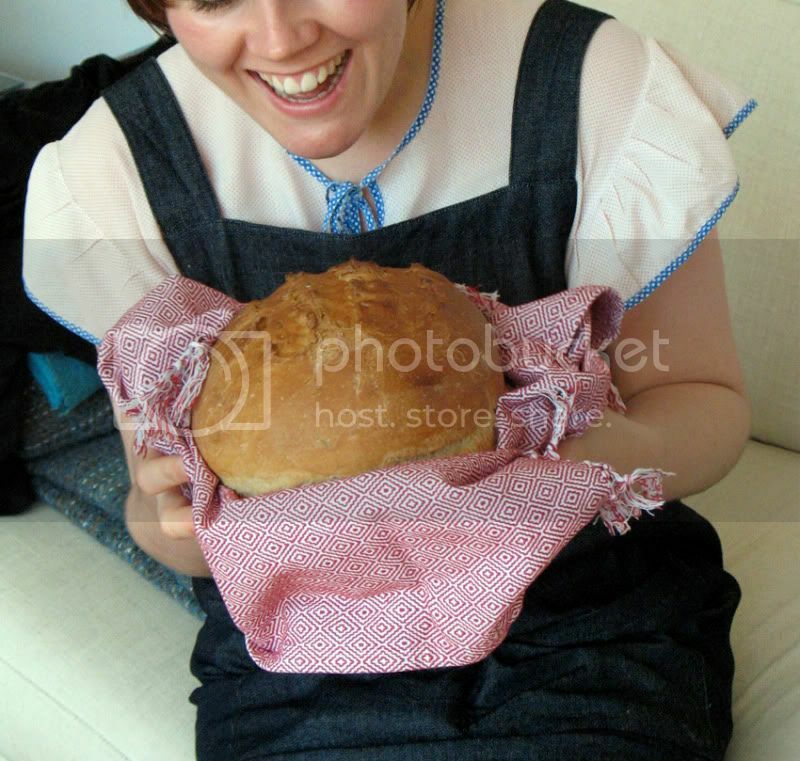 No recipe today I'm afraid. I thought I'd tell you about my great day out on Saturday instead. 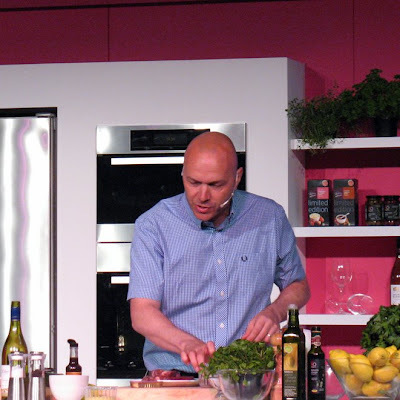 The lovely people from Forever Better invited me to join them for the BBC Summer Good Food Show last week. Of course that was an offer which I just couldn't refuse and so I got up at 6.00am last Saturday to get on a train to the NEC arena in Birmingham. I arrived in good time to meet up with the Forever Better staff and fellow food bloggers, Anne, Celine, Jan, Jules, Naomi, Nic and Sunita. We began the day with watching Simon Rimmer give a cooking demonstration in the summer theatre, after which we had a drink in the VIP cafe (where some of us took the opportunity to take a few snaps of Simon Rimmer, Gino D'Acampo and the Hairy Bikers as you can see on the other blogs) followed by lunch in one of the NEC cafes. With our bellies full we then had quite a bit of time to explore the stalls and see what wares the various exhibitors had on offer. There was everything from cheese to bread, deli food, cereals, specialist oils, tea and coffee, sweets, cakes, vegetables, cold meats, wine, whiskey and vodka to cookware, cookbooks and magazines. Of course most of the stalls had free taste samples of which we made the most. We all met back up as a group for an introduction to a range of fantastic Miele appliances, which left me wanting a new fridge, a new cooker and a steam oven. Shame I live in a rented flat with a landlord-special type kitchen, which has got neither enough room nore the flair to do any of them justice. I'll just have to continue to dream and want for now, I guess. 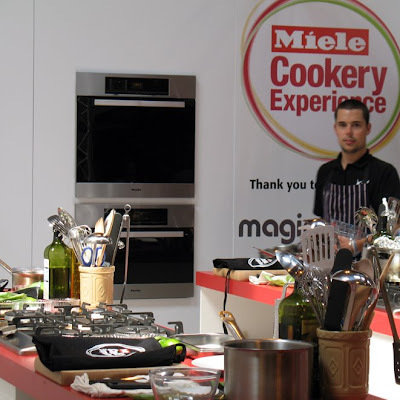 The main event for us was the Miele Cookery Experience, where we got to participate (think Ready, Steady, Cook or Can't Cook, Won't Cook, even though of course all of us can and will cook) in a cooking demonstration by Sophie Michell. That was a bit nerve wracking I have to admit, as it was in front of an audience which I hadn't really considered. 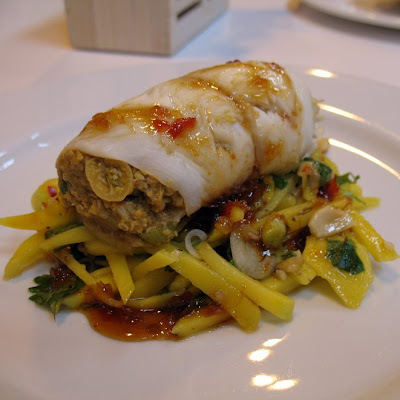 Once we started though it was good fun, especially as Sophie and her helpers took us through cooking Thai inspired Steamed Lemon Sole stuffed with Crab Meat on a bed of Green Mango Salad, accompanied by Steamed Scallops. I'm usually not that great cooking seafood, but was really impressed with the result, which of course we got to eat afterwards. That made me want a Miele Steam Oven even more. 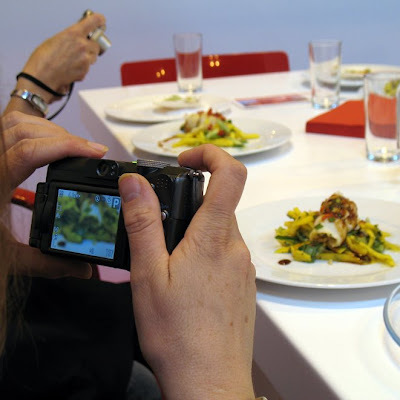 And this is what happens when you eat with food bloggers. Everyone has to take a picture of the finished plate before they dig in. 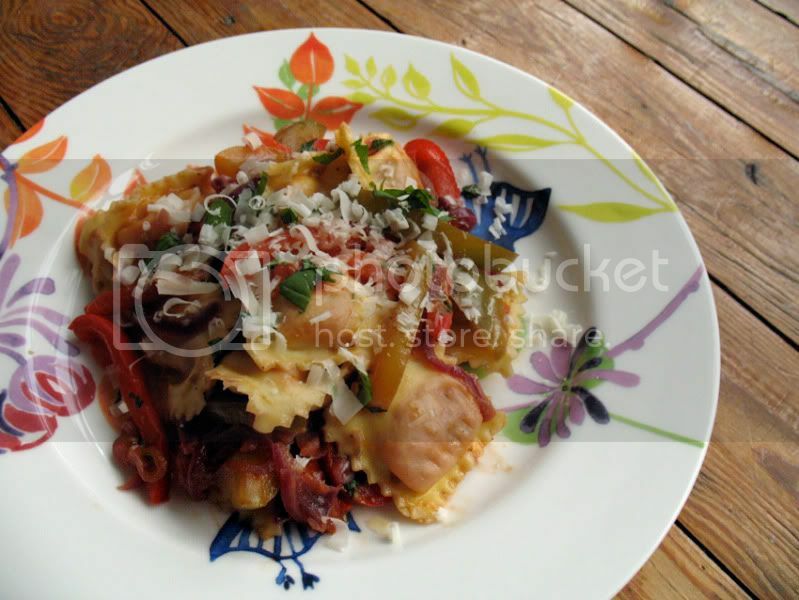 This is another of those recipes that is perfect for midweek dinner, or as in my case if you have some peppers that need using. I had never heard of peperonata until my brother cooked it once a couple of years ago at my mum and dad's house. I've made it quite often since and I just realised that I had never blogged about it. How could that happen? It really is one of those simple ingredients, simple cooking and maximum satisfaction recipes. 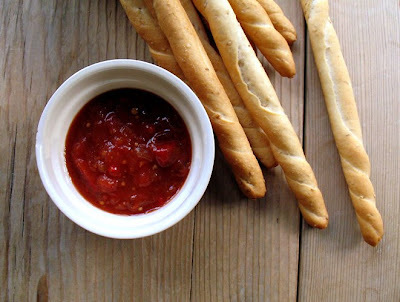 You can have it warm with pasta as I did tonight, but it is also great cold spread on fresh, crusty bread or as an addition to a tapas table. Heat the oil in a large heavy bottom frying pan. Add the onion and the pepper and sautee over medium heat for about 5 minutes, stirring regularly. You want everything to soften but not brown. Add the tomatoes, garlic balsamic vinegar and season with salt and pepper. Stir, cover and continue to sautee over a low to medium heat for about 20 minutes or so. Stir occasionally. Add the parsley or basil, some parmesan and stir to mix. 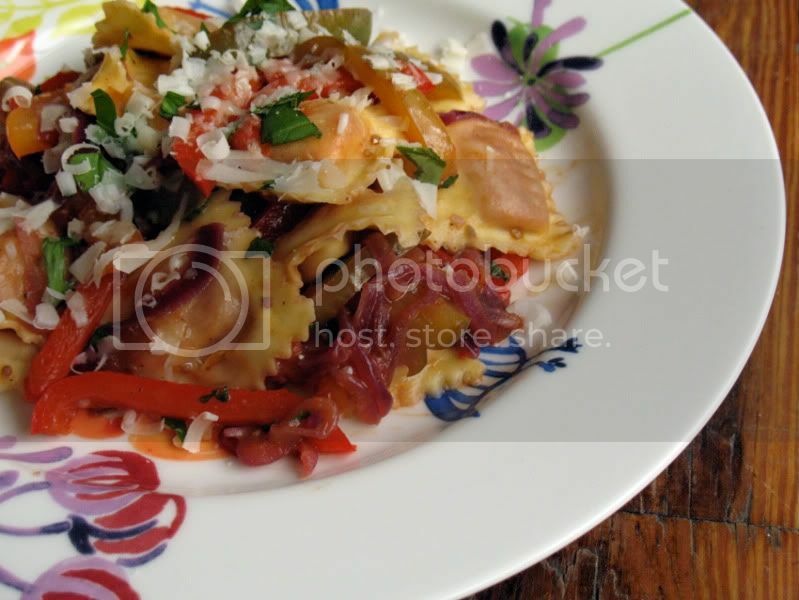 If you are serving it with pasta, mix in the cooked pasta and top with plenty more parmesan. Otherwise allow to cool before serving. You can make it a day in advance and keep it in the fridge. 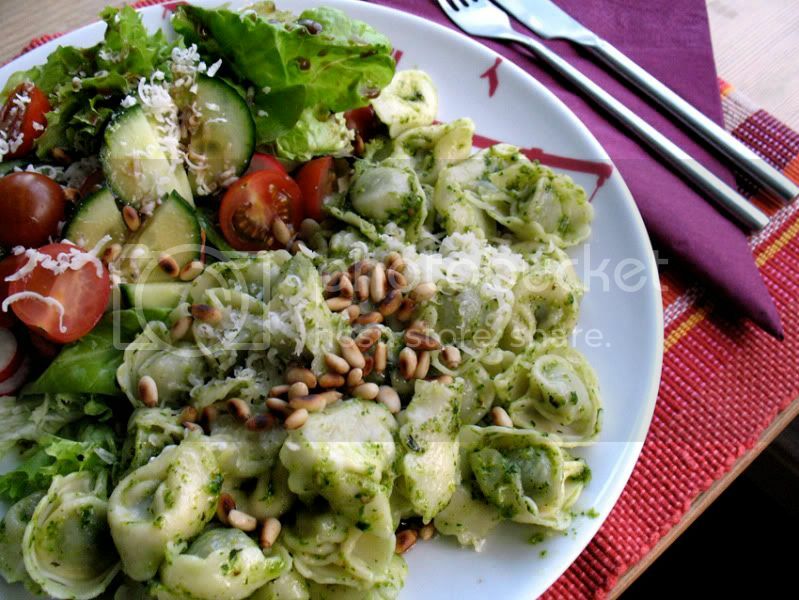 Fresh pasta and pesto is one of those meals that I always default to when I get home late from work or on those days when I don't really feel like spending a lot of time in the kitchen. It's quick, simple and good and I usually have all the ingredients around. Traditionally it would me made with a pestle and mortar, smashing the basil leave little by little, but most time I just use my stick blender. It doesn't make the pesto quite as smooth as doing it by hand, but it's quicker and I actually like a slightly grainier pesto just as much. What is your quick mid-week dinner of choice? Wash the basil leaves and dry them in a salad spinner. Toast your pine kernels in a dry frying pan for 2-3 minutes, until golden. If you're using a mortar, pound the garlic with the salt until you have a smooth paste. Add the pine nuts and keep pounding. Then start adding the basil leaves, 2-3 at a time and keep mashing until all is reduced to a silky paste. If you want you can freeze the mixture at this point. Add the cheese, stir and then add the oil and stir with a wooden spoon until you have a smooth, silky pesto. The amount of oil you adds depends on your preference of texture. Alternatively place all ingredients in a container and blend with your stick blender until you reach the preferred consistency. Mix into hot pasta and serve straight away. You can pour any leftover pesto into a clean jar, top with a layer of olive oil, cover tightly and keep it in your fridge for up to a week.